We are spreading kindness this month through our 100 Acts of Kindness project. We are challenging our readers to perform 100 acts of kindness between Jan 16th and Feb 14th. You can read more about our kindness challenge here. Many of our blogging friends have joined the challenge and will be sharing ways that you can spread kindness here and on their blogs. Today we have Liz from Made on Maple as our guest blogger. She is sharing this week's kindness challenge along with two beautiful projects. Besides being a talented and generous seamstress, Liz is one of my best friends. I am so excited to have her posting today. Welcome Liz! I'm honored to be participating in the 100 Acts of Kindness Project! To be kind is such an important life skill, and I try daily to impart my wisdom on the topic to my children. Some days I do better than others. Just like some days I'm kinder to them than other days, but I'm always trying! One way that I show kindness to my family and friends is by sewing. I started sewing almost 4 years ago, and I stay up late putting my skills and love into projects for those around me. Sew, I was a little bit nervous when Kristina asked me to participate in this project. I'm an elementary school teacher in retirement while raising my children, so I have the educational background to come up with ideas for children, but I'm out of practice. I do encourage arts and crafts as a daily activity for my little ones, but I wasn't sure that I could come up with a toddler approved idea for the 100 Acts of Kindness month. Then I reviewed my Pinterest boards, and I knew exactly what I would do. I *heart* party garlands, and my kids and I *heart* friends. We don't live close to family, so our friends are our family. I talked it over with them and we thought we should show some love and kindness to our friends. For our act of kindness we "heart attacked" our friends letting them know that we love them and appreciate them. Kindness Challenge #3 this week will be to "heart attack" a friend. You can make and take some Party Garland to a friend, or choose another way to make your friends and/or your children's friends feel loved. Good luck! Try not to get caught! My daughter made her party garland out of construction paper, glue and twine. One sheet of construction paper (9"x12") turns into 5 pieces of party garland. Cut out the pieces and fold them in half lengthwise. I cut out all the party garland pieces. Then I put Grace to work cutting out hearts. A favorite activity of my 5 year old. Then we placed a long piece of twine in the fold of all the paper party garland pieces and glued the party garland pieces together. I made arrangements for Grace to go to her friend's house when she wasn't there to "heart attack" her. Grace was so excited about doing this that she couldn't sleep the night before, and she woke up way too early the morning of. How great that she was so excited about showing kindness! I made similar party garland for my friends, but I used fabric. 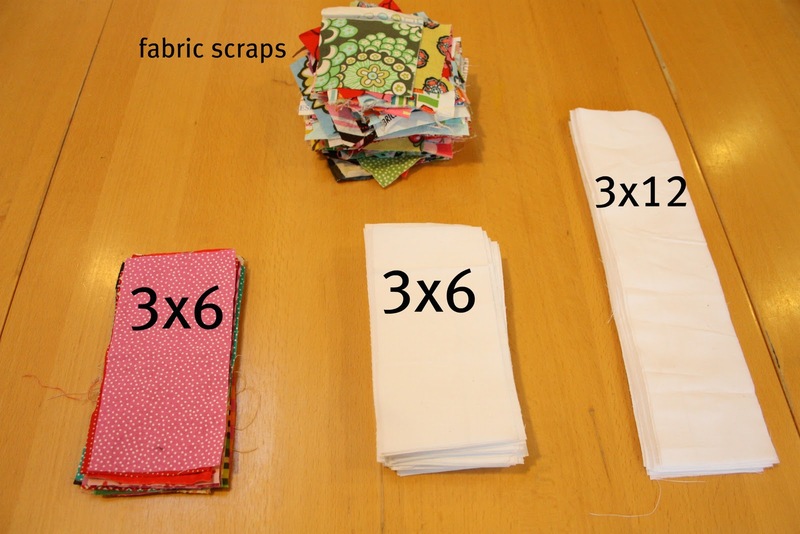 I used the exact same dimensions with my fabric as Grace did with the construction paper. I used bleached muslin for the white party garland pieces, and fabric scraps for the colorful party garland pieces. First I folded all my party garland pieces in half lengthwise. Instead of colored construction hearts I cut tons of fabric hearts out of scraps. 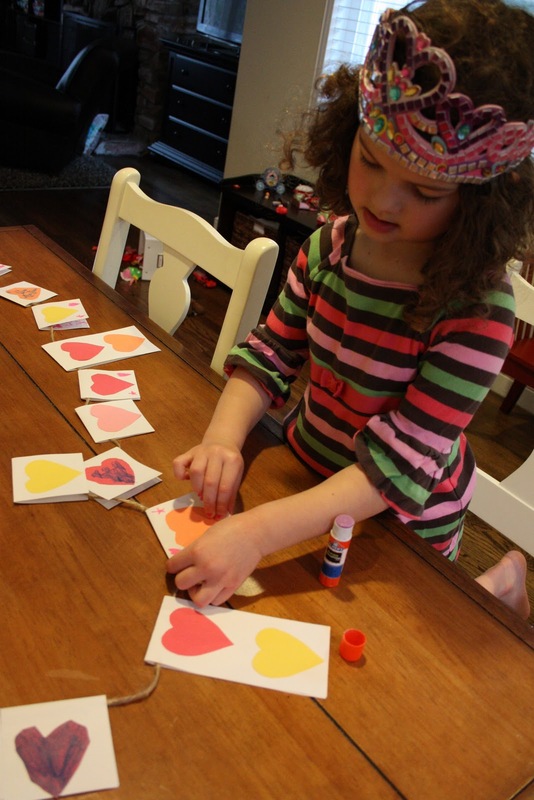 I used a glue stick to glue the fabric hearts to the folded party garland pieces. Then sewed a straight line down the center of each heart. I repeated this over and over and over. Then I sewed all the party garland pieces together up above the top of the hearts. I hung it up in my house to make sure it was as cute as I was hoping it would be. I loved the results, and I hope my friends do too! 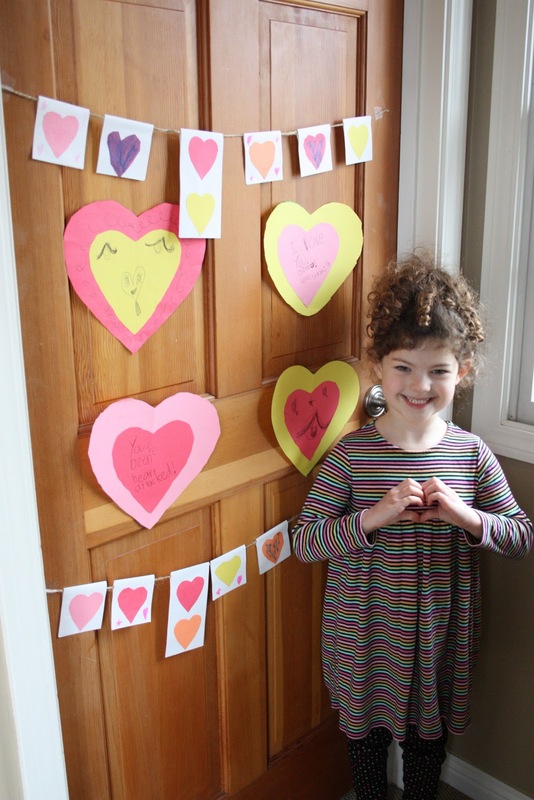 I packaged up the Valentine's Day Party garland and "heart attacked" my friends. I also added some very tasty treats to go along with my Valentine's Day Party Garland. Treats are always a kind thing to give away. Participating in this challenge has helped me to reflect on ways to add kindness into my daily routine. Hopefully after doing 100 kind acts, I'll be a little better at modeling kindness for my children, and they'll be better at being kind to one another and to those around us. My house is quiet now, so I must get back to my sewing room. You can find some of my favorite things I'm made with love here and here and here. Thanks Liz!! Love this post! Both tutorials are awesome. We will definitely be heart attacking some friends this week and will probably try to make at least two party garlands (one to keep and one to giveaway). This would make my kitchen so festive for Valentine's Day! How are you going to "heart attack" a friend this week? MiaB- it is never too late to start! You should totally join us. Maybe just do 50 acts of kindness instead of 100. There are 2 weeks left! Thanks for stopping by! Ooooh so so PRETTY! Love your heart crafts. Adorable! Fun Tutorial! Liz, add "garland queen" to your list of talents. I love that you have a kid version and a mom virsion. What a great idea to do a kindness challenge. We'll have to jump on board with this. And Kristina, you have so many GREAT ideas on this site. Looks absolutely beautiful to me! What a great idea and how lovely to receive. I will pin it..
Love the heart attack idea! I always comment that I wish I could sew and need to start, and I have to repeat myself again. The fabric garland is lovely. How wonderful... and a great idea too.